Over the past few years of helping moms start, grow and build their blogs, I’ve heard this question over and over. I myself still struggle with it from time to time. It’s not just an initial issue beginning bloggers have. It’s a weekly question that comes up for all bloggers. What should I write about to get people to my blog? If you’re starting your blog and you’re staring at a blank blog post. Or if you’ve been blogging for years and you’re just stuck. What next? What topics should you write about? I’ve written multiple in depth blog post on what to blog about and how to figure out your blog niche. And even though they contain amazing information, they are abstract. I get it, we all want things handed to us on a silver platter. I want it too. Where is the easy button to get more blog post ideas? Why can’t someone just tell me exactly what to do, and I’ll do it. Don’t feel bad for looking for that easy way out. Your search has finally come to an end! I’ve heard your silent frustrated signs, your negative self talk and feelings of confusion. It’s demotivating not to have a plan. I know you’re a hard worker; you’re a mom juggling kids, chores, meals and a blog. Instead of figuring out every night what to make for dinner, you have a meal plan for the week. Instead of deciding at the grocery store what to buy, you have a handy dandy list. 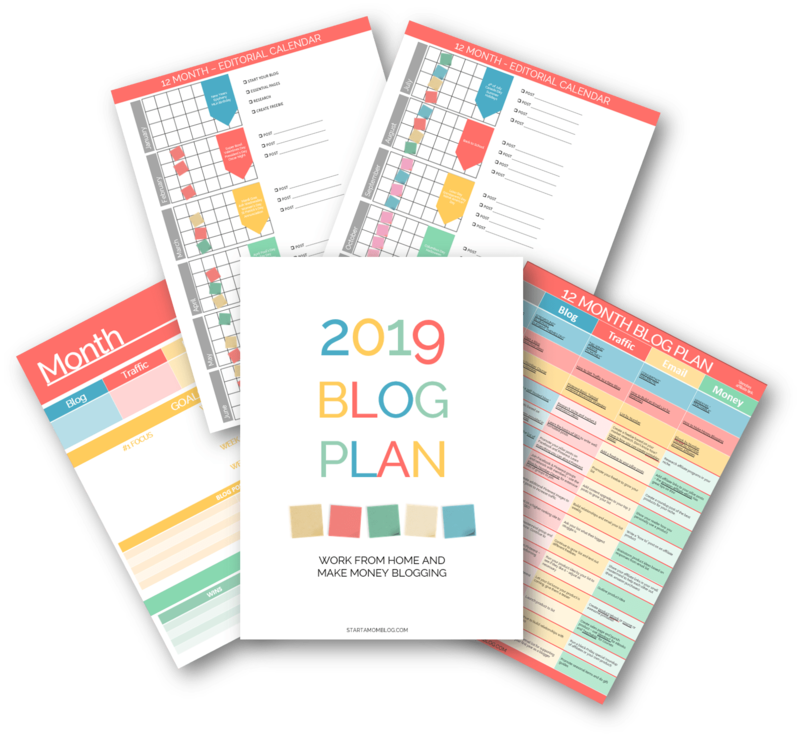 Why then when it comes to blogging, you don’t have a plan? A list? A go to page full of blog post ideas? Over the past few weeks I’ve searched the web high and low for amazing blog post ideas. I’ve compiled a HUGE list of article ideas that are popular. Ideas that span over categories such as Kids Activities, Fashion, Food and Fitness. These are not just vague ideas – they are the exact topic you can write a blog post about. It’s not, “healthy food”, it’s ideas such as “healthy snacks for kids on the go” or “pregnancy superfood” or “how to cut an avocado”. 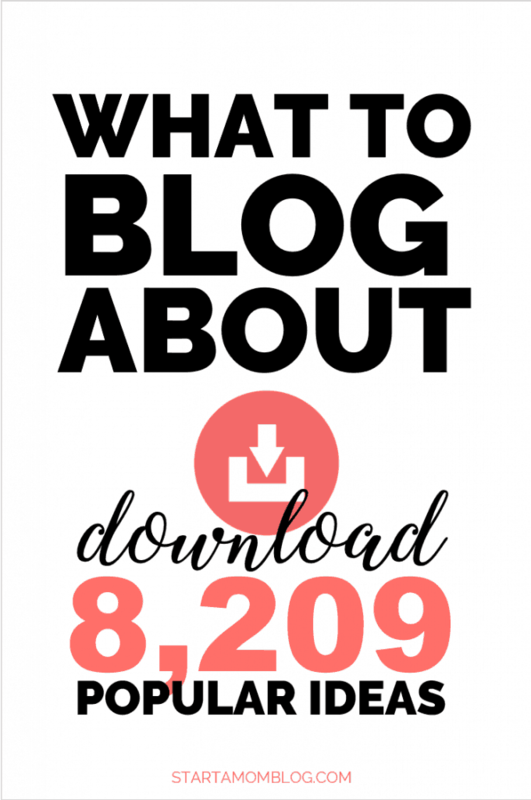 This list contains over 8,000 blog post topics that people actually search for! 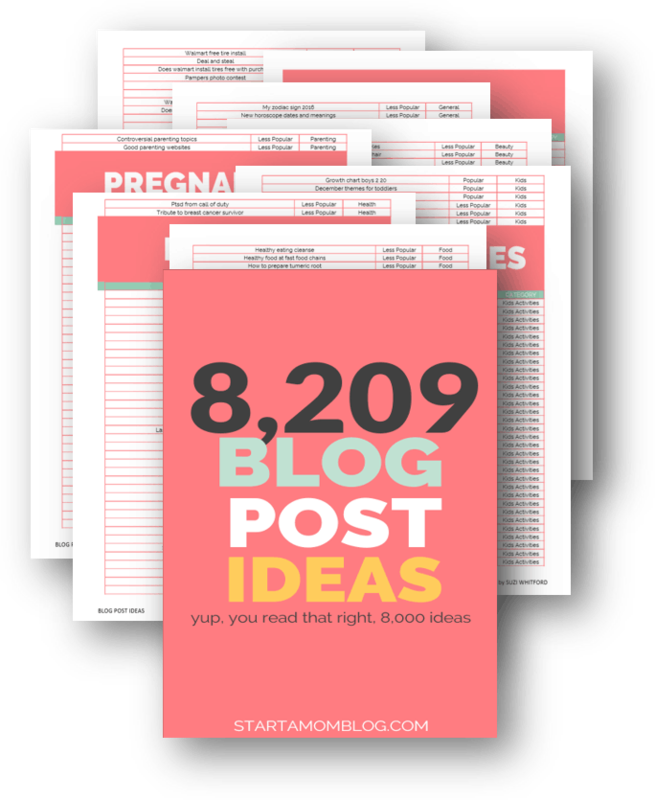 You read that right, over eight thousand blog post ideas ranging from crafts to parenting to travel. When you’re blogging, you’re creating content for your audience. You want to make sure you’re spending time writing a blog post that will truly help people. And if no one searches for “my little peanut’s first day of school” then that article won’t get much traffic. You’re very welcome, and even encouraged, to add personal stories to your blog posts. Include a bit about how your sweet little peanut enjoyed her first day of school, but weave it into a post about “First day of school sign ideas”. Now that’s a term that people actually search for. Blogging is a dash of “Dear Diary” with a big heap of helpful advice and tips. You’re building a relationship with your readers through your blog. And no one likes that friend who only talks about herself. But golly, we love the friend who can give us great tips and tricks when we’re struggling with an issue. Blogging isn’t rocket science, it’s just helping your friends online with the best advice you can share! 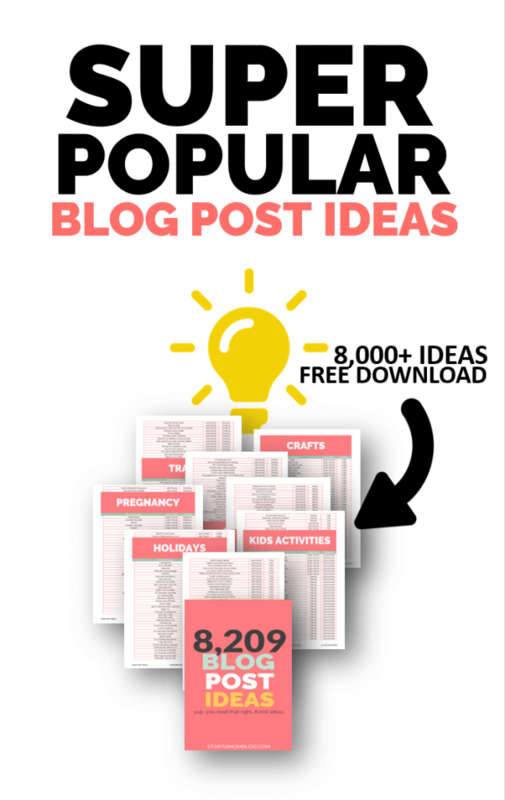 And to help you figure out what people are struggling with, what problems you can solve, you can have this list of over 8,000 blog post ideas. Think of this list as 8,000 little problems you can solve. You probably won’t be able to write on every one of the topics, but by golly, you’ll find at least 52 fantastic blog post ideas. Topics that you can give amazing advice on. That’s enough ideas for the entire year, and you’ve only used 0.6% of the entire list! So if you want to be an amazing friend, repin and share this post with others. Even if they blog about the exact same topic, there are thousands of ideas for everyone. And they’ll think you’re an angel from above blessing them with a huge list of blog post ideas like confetti raining from the heavens. From the bottom of my heart, I pray this list helps you! It’s taken me weeks to put together. I know you’re busy and you have a lot on your plate, so I want to make blogging as easy as possible for you. There are 28 categories covered in this list. I encourage you to glance at categories that aren’t in your blog niche. You may stumble upon an idea that could be perfect for your audience! I’ve also included the popularity of each term in the list. Remember, the more popular a term, most likely, the higher the competition. So make sure to write blog posts on super popular and less popular topics from the list. Pro Tip: As the holidays are approaching, look at the section on Gifts. These types of blog posts are fantastic for increasing your passive affiliate income with Amazon! 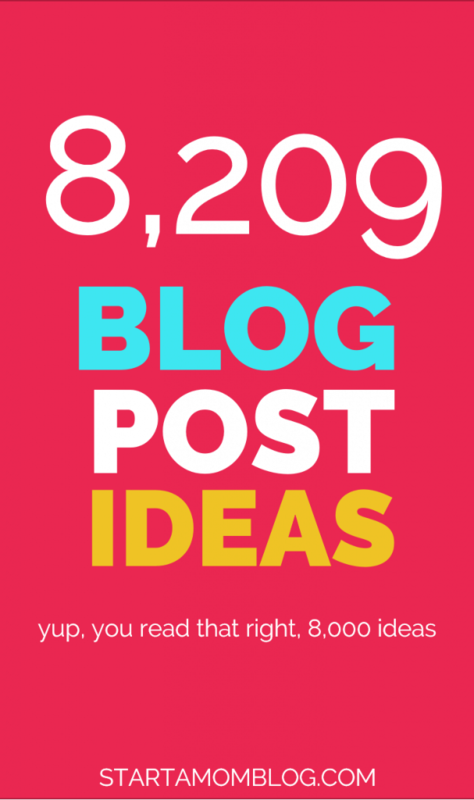 Now that you have 8,000+ amazing blog post ideas, here is how you write a good post. Aim for 1,000 words or more. Include H2 and H3 headings. Make it easy to read with bullet points where possible. Go through the super cheap Post by Number course to learn exactly how to structure a good blog post that ranks. If you haven’t started your blog yet or you’re stuck and need ideas, this enormous list of blog post ideas will help you! Once you download the list above, you can take one blog post idea and create multiple pieces of content with it! Well, you get the idea. And if you don’t, just read the different types of blog posts below. With the enormous list above and the tips below – you’re pretty much set for the next year of blog posts! Always write for your audience. What will improve their lives and make them better. These are the types of posts that get shared the most. They are practical, useful and simple. Search your Facebook groups or mommy profiles to questions and topics they are talking about. This could start the idea for a great post that you already know people would be interested in! Type in a noun and the site will spit out an idea for you! I just typed in ‘mom’ and got “Why moms are more tempting than Cinnabon,” or this one “How to build an empire with mom bloggers.” Enjoy! Combine your most popular posts and create a new post that compares or contrasts the two topics. Remember to create your internal links between the posts when you’re done! Get ideas from your followers. Ask them a question on what their biggest issue, problem or obstacle is. Answer it for them in a blog post, they’ll love it! If you’re low on time, why not make a video post of you cooking an awesome meal, throwing a beautiful Pinterest worthy birthday party, or doing an fun new exercise? Videos spread very quickly and are shared often! If you have the confidence to put your face out there, this could be a big time saver and could attract new followers. New Years Resolutions, Valentines Day Treats, Easter Activities, Fourth of July Family Fun, Back to School Tips, Fall Favorites or the Best Christmas Presents – let the seasons inspire you! Did something big happen recently in the news? How does this relate to your niche? Is there a new study out saying that dairy causes weight loss, or that babies can be potty trained at 1 year old? If you’re quick to write about these topics you may scoop up some of the traffic that goes along with the news story too! Double bonus! I love before and after pictures! It’s always fascinating to see the change and hear what the person did to achieve the result. Did you have a messy house and now it’s sparkling clean? Show some before and after pictures and list your tips. Have a beauty tip that cleared your skin? Show the before and after pictures! These images give a ton of credibility to your post too! Make a List Post (like this one!). Give your readers a useful list of recommendations or tips they find useful. It’s easy to read and contains a lot of information in a quick post! Pictures say a thousand words, so let them! Make a post with beautiful images that your readers will enjoy and add a few lines of text. Examples could be: essentials for your diaper bag, 10 must have ingredients to stock up on, my baby’s favorite toys, etc. This will not only help you, but your readers too! Have a foodie blog, interview a published food blogger. Have a parenting blog, interview a mom of 8 kids to learn her tips and tricks. It’ll be just as fun for you as for your readers! This post has the potential to increase your traffic dramatically! Take a topic your readers are struggling with and make a pros and cons list. Example: What are the pros and cons of bribing your children? I’d read that because it gives both sides. Talking is much faster than typing. Try a podcast post for when you are low on time. Readers enjoy knowing more about the blogger they follow. Why not reveal a special ‘Day in Your Life’ with your followers. Share your Thanksgiving meal, or your son’s birthday party, or your family’s trip to the beach. Or relate to your readers and share an ordinary Tuesday with the world. Who doesn’t like free stuff? You can team up with a few other bloggers and decide on a great giveaway and boost each other’s traffic in the meantime. Send your readers a quick questionnaire and summarize the answers in a post. You can add a few charts and graphs and spruce it up! Do you have some fantastic posts that you read this past week? Found a few new bloggers your readers would like? Create a post with a list of links to posts you know your readers will love. The outbound links will help with your blog’s SEO and may get you noticed by larger bloggers who could return the favor. Have a fellow blogger guest post on your blog. This is the most efficient way to get a post out with the least amount of effort and it also builds a relationship with someone in your niche. This is another type of post that has the potential to increase your followers! If you have a lot of content, create a post with your best posts grouped together. This will make it easier for your readers to find more related information on your site and it will boost your page views per visitor. You can even make this the ‘Start Here’ page to help guide your readers on your blog. List your favorite bloggers, favorite parenting hacks or favorite quick and easy meals. It gives your readers a nice list to read and let’s them get to know you better! This works well around Christmas time or any large events. Examples could include: My Christmas Wish List, my Summer Vacation Wish List, my Daughter’s Wish List for Her 10th Birthday. Can you take pictures like a pro? Know how to change a baby’s diaper with one hand? Share your momma skills and tips with others who will benefit! Have you read a fantastic book lately or bought a new product that worked miracles? You can also reach out to the author and get a quote from them to give more credibility to your post! I recently stumbled upon a post for a Christmas Playlist and loved it! The blogger used Spotify to create the list of songs and I found myself returning to her site multiple times to find the post again. 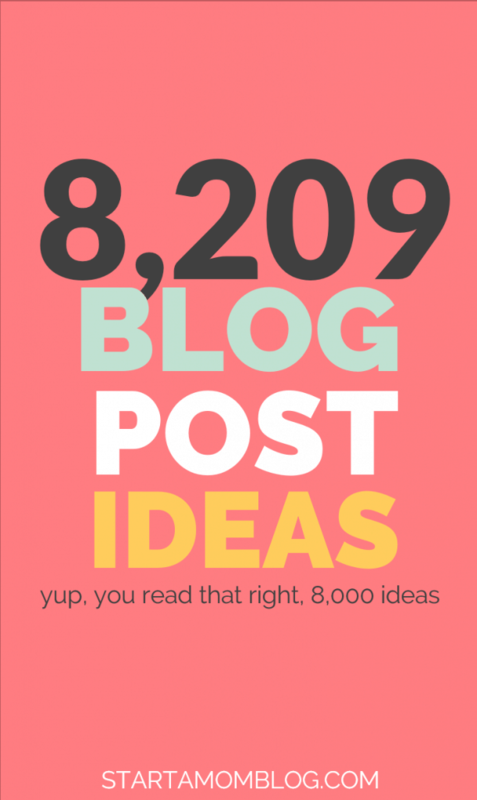 Let me know what you think about the list of 8,000 blog post ideas! I hope this list makes writing a blog post a bit quicker for you as you run around chasing toddlers and cooking dinner. Please share this page and leave a comment below. I’m excited to hear from you! OH my goodness, Suzi, this list is amazing! I don’t know how you do it all. Thank you so much for this list!! I just skimmed it and fell in love. I can’t really to really get into it and add some fun post ideas to my editorial calendar! You’re the best. So happy you like it Heather! Thank you! You are my hero! I’ve been in such a funk when it comes to thinking up new ideas for my health and wellness blog (and dreading doing more keyword research). Thank you for this ? Thank you! Thank you! Thank you for this list! I’m a new blogger and really needed direction for the Christmas season. This is going to prove to be very helpful. As always, Suzi for the win! I think I might just start crying! This post came at the EXACT moment I needed it! I cannot thank you enough for everything that you do! Thank you so much Rebecca!! I’m always here to help! Thank you for sharing this information. I’m a new blogger who was beginning to get overwhelmed with all that I needed to do to make my blog profitable. Thank you Suzi for teaching us how to blog the right way!!! Thank you so much for the sweet comment!! Thank You! As usual, you overdeliver. Your resources give new bloggers a a leap with creating that foundation. I’ve learned alot from you thus far and can’t wait to launch my blog. Thanks for all the resources you give, it truly means a lot. Thank you! You’re going to do great when you launch!! I can’t wait to view this wonderful list you have put together for us. You are so blessed because of your giving heart. Wow Suzi, you’ve truly outdone yourself here! Thank you so much for sharing all of this incredible information. We’ll surely think of you throughout a lifetime of Blogging! That’s my goal! To give you a lifetime of blog post ideas! Awesome as always, thank you Suzi! Brilliant idea to add the popularity. So happy you appreciate it Estie! Suzi, this is a great idea! I appreciate the hard work you put into this blog post and researching the Internet to compile such a thorough list 🙂 I can’t wait to scan the list and start writing! Thanks again for everything you do for the blogging world! Suzi, you’re the best online friend a mom blogger can have!! This is exactly what I struggle with! Thanks so much for this amazing resource!! Suzi, I meant to comment last night but this list is awesome. I’ve read it multiple times since I got the email and it is seriously helpful for all bloggers. Thank you Suzi! You’re always so generous and you always over deliver! The blogging world is fortunate to have you as a part of it. Oh I am blessed to be a part of it! HOW DID YOU READ MY MIND THIS MORNING!!! Seriously! Thank you so so much for this inspiration, Suzi!! YES! So happy to help Jolynn! Thank you Suzie!! You didn’t have to do all of this for us!!! You are amazing!!!! Thank you Nicole! It’s hard – but we’re here to help each other – so happy to do this for you! my mouth dropped when i saw this. So amazing! So happy I can help!! Thank you! I haven’t read the list yet as I am sitting in my mom’s hospital room, but I am really excited to do so as soon as I get the time! You’ve always been one to outdo Suzi! This is a massive list I’m sure many of us busy mamas will appreciate. So happy to help Lily!! The list is amazing. You really did a good job. I’m still imagining how you were able to put them together. You are a solution provider. With this list I’m good to go. Thanks a lot. The auto reply email could be in your spam folder. Once you sign up, you also get to a page where you can download it directly instead of fishing through your inbox 🙂 Should be the second page after you subscribe. O.M.G. this list is over the top cool! I have not started yet but getting closer daily! I love this thank you so much! You are too be admired! Thank you so much Michele! So happy to help! Thank you for your kind help Ma’am! As usual, Suzi, you always deliver in a BIG way! You are immensely appreciated! Hello! I found you just recently and your content so far is AWESOME! It is not working for me to download this list. When I enter my email address and click to download, it does not take me to a different page and I am not receiving an email. Thanks so much. Keep doing what you are doing. You rock!! Hi Susie, Thanks for your concise ideas on topics for blogs. I’m not a mom but a soon to retire teacher wanting to start blogging! Often the ideas about parenting and children are needed by teachers. Suzie, this list is simply marvelous. It’s easy to comprehend and it opened up a plethora of blog posts ideas for me. It’s just astonishing how you made it all simple to read and follow. I just signed up for your 8,000+ Blog Post Ideas List. I can’t wait to read them. I believe it’s really going to help me a lot. 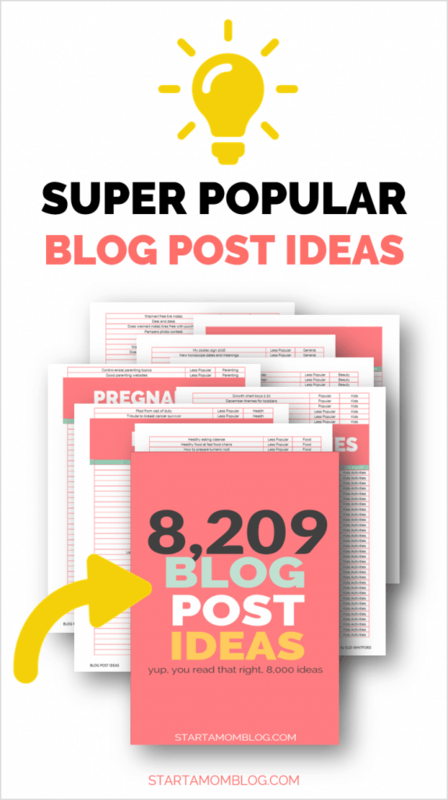 I simply love how you listed the different types of blog post ideas. It’s totally worth a read! Suzi, I just keep coming back to your site for more every day. Thank you so much for these post ideas and all the content that you share for free. I’m totally hooked and I just wanted to say thank you.